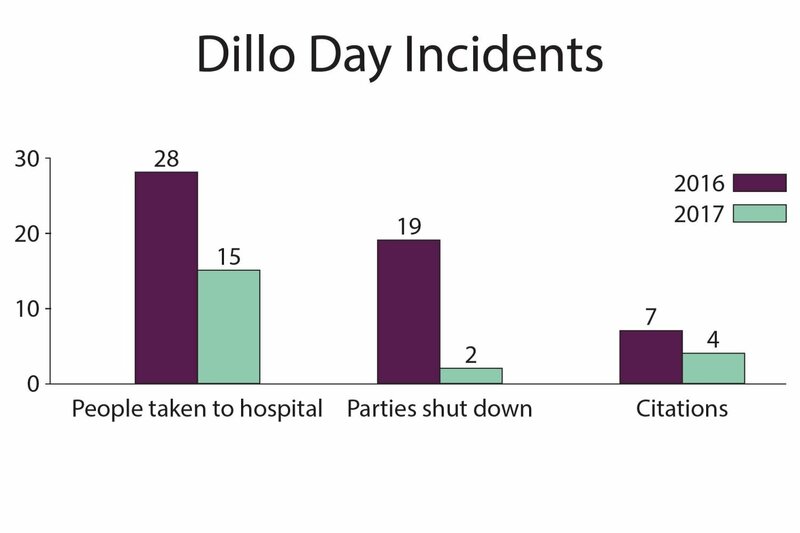 Fifteen people were taken to the hospital for alcohol intoxication and other medical emergencies during Dillo Day this year, down from 28 the previous year, police said. Last year, the number increased from 2014, when 22 people were taken to the hospital. During the course of the day, 31 were calls were made to the police and fire departments, Evanston police Cmdr. Joseph Dugan said. Of the 15 calls to the fire department, all resulted in transports — 13 of which were alcohol-related. Additionally, Evanston Police Department shut down only two parties this year, compared to 19 the previous year. None of the people involved were given citations. Police only handed out four citations in total this year, as opposed to seven last year. Three were for public urination, and the fourth was for underage drinking, Dugan said. No citations were handed out for drug-related activities. This is the fourth year in a row that no one was arrested. Though Dugan said he was not on duty during the event, officers who were on the festival grounds told him that the quietest part of the day was the last few hours of the event.